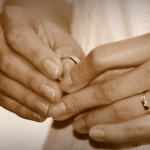 There Are Reasons to consider If You Like to Have a Renewal of Vows in Melbourne. There are many reasons to consider a Renewal of Vows ceremony, maybe your wedding was not what you’d hoped for, or maybe it was so fabulous that you can’t wait to do it again! A Renewal of Vows can be held to mark important wedding anniversaries or just because you feel like celebrating the joy of your ongoing marriage. These ceremonies can be very special and can involve your children as well as your original attendants and anyone else whom you would like to include. You may like to repeat the vows you said to each other on marrying or write new vows which better suit your present stage of life. They can be humorous, romantic, a combination of both, or whatever you wish. There is no legal aspect to these ceremonies; so the sky’s the limit, it’s purely your celebration. Together we can plan a truly memorable occasion to celebrate your marriage. Read more about a civil wedding celebrant in Melbourne and finding a civil marriage celebrant in Melbourne.